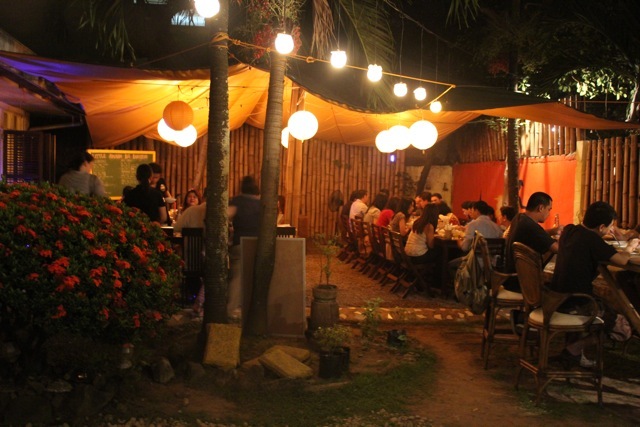 “Fresh Asian Street Food” tucked away in a unexpected residential part of Cebu. Little Saigon, Big Bangkok is definitely one of my top picks for places to eat when I am in Cebu and don’t want anything lechon related. If you are visiting Cebu for Sinulog this weekend, try and get yourself a table here if you love spicy, flavorful Thai, Vietnamese and even some Indian dishes. Go for the food. And ignore the slightly out of the way location, the sometimes eyebrow-raising setting and little details that are consistent with their street food vibe, and prepare to pay more than you would for a typical dinner in Cebu (plan on PHP500-600 per person, without wine). But this is far from typical food and I find it is totally worth the price and the effort to get there. Located on the ground floor of a residential home where the restaurant’s proprietors also live, it is a 1960’s-70’s home in need of care. The front lawn has been covered with a tarp and gravel has been laid out beneath the wooden tables. Let’s just say it has character… During the day, it is almost impossibly warm outdoors, but recently, they have obtained an aircon for an indoor room so if you can’t handle the streetside feel. But if you’re young and have a spray bottle of OFF! 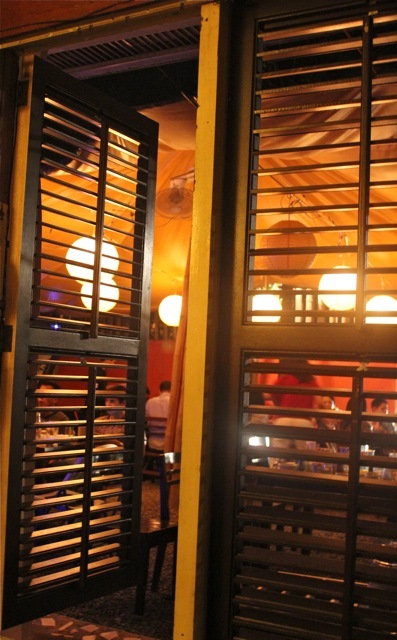 with you, sit outside for the best experience overall… An evening reservation is far more desirable than lunch. The menu changes from day to day, though some favorite dishes seem to be there most of the time. I have literally tasted 90-95% of the dishes on offer on the several evenings and one lunch that we dined there. I think Carmel smokes her own pork, and this flavorful ingredient appears in several dishes. One evening it was added to a salad, that was beautifully dressed, a real pleasure to eat. 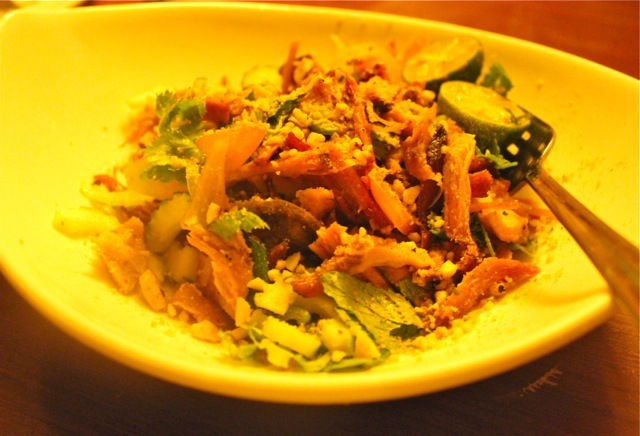 Sometimes the smoked pork is in a fried rice dish, also delicious. 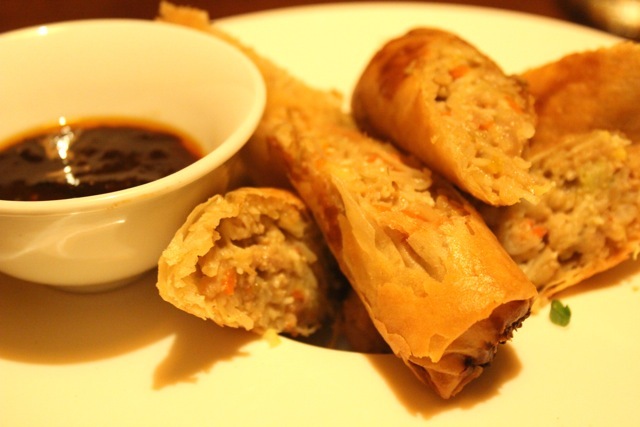 A plateful of cha gio, or vietnamese spring rolls, three pieces (PHP50 each) cut into six. Served with the roasted chili sauce that had great depth of flavor, and a slow burn spice wise. If you order more than half the menu, you will see some 6-8 key sauces or condiments emerge, and they were mostly delicious and well-balanced. This stunning platter of banh xeo, a rice batter crepe filled with tofu, bean sprouts, sometimes pork, chopped herbs, etc. was amazing. I have to say, on our last visit, Carmel really brought her food to the next level, and some cheffy skills were on display. We ordered this another time and it came looking a bit more pedestrian, but still tasted amazing. On this last visit, everything hit the table carefully plated, with a beautiful balance of flavors all around. 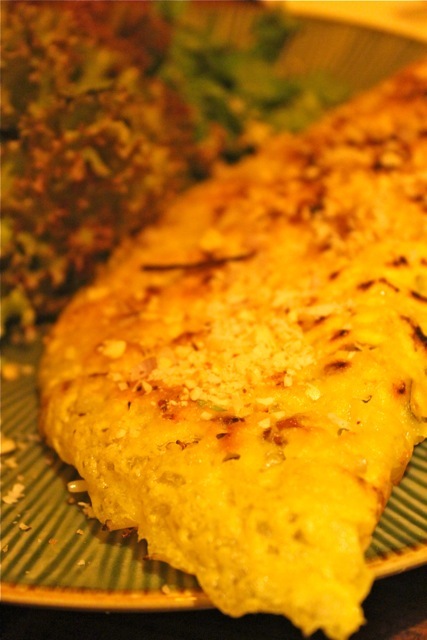 You cut up the crepe, pick it up and wrap it with lettuce and herbs and dip it into the sauce for a mouthfull of texture and flavor. 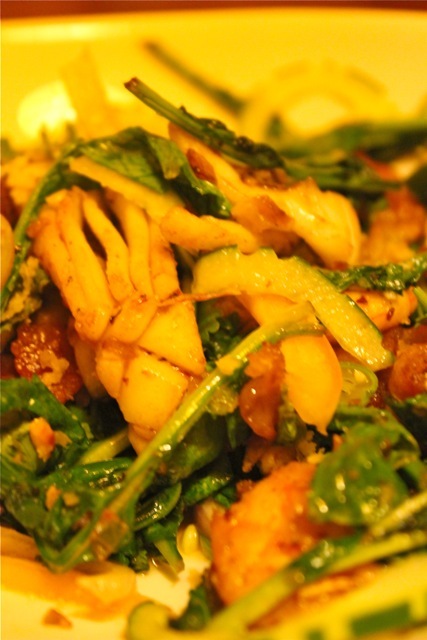 A thai squid salad, made unconventionally with young wild arugula and with the addition of bacon? seemed dischordant, but it tasted wonderful. Pork and seafood often pair well, and while this wasn’t the most authentic set of ingredients perhaps, I loved it. Nice spice incorporated into the dish as well. Tod Mun with Som tom or fish cakes served over a shredded papaya salad was okay, though the papaya salad could have been grated or sliced finer and it wasn’t bruised enough so they were less than flavorful. We had this on another visit and it was a slam dunk then. The pad thai came out enveloped in a thin egg wrapper, just beautiful! It was quite sweet, almost too pinoy sweet, but with some fish sauce and kalamansi (ideally limes!) added at the table it was still very good. It looks a bit pale in this photo, but as you’ll see further down, on another occasion it looked slightly different. 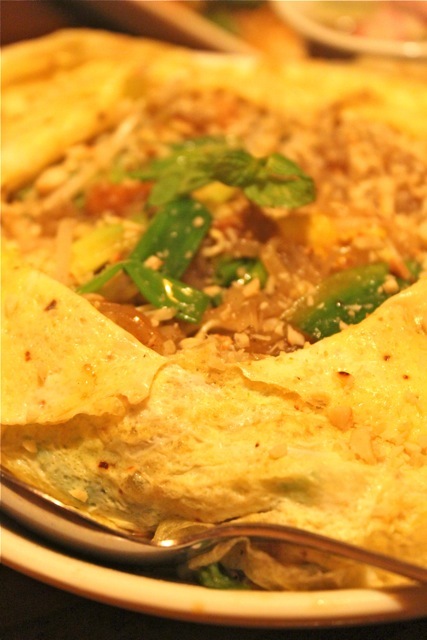 When your table is filled with spicy dishes, this sweet noodle helps to soothe your overworked palate. 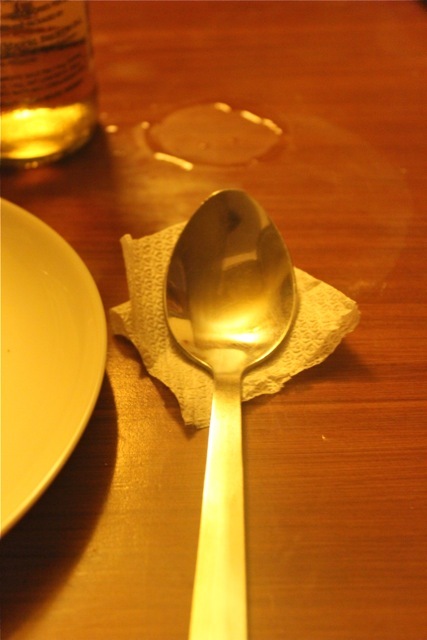 The red chicken curry was incendiary, and bits of the dried chilies were present in nearly every spoon full. I was nearly fed up by the time this dish arrived, but I got another two scoops of rice to enjoy with this curry. Delicious. On another occasion, we had their other curries, and even a beef rendang, all of which were quite good. What comes across in this cooking is authenticity, fine ingredients, and most importantly, soul. It’s what’s missing from many a chain or mall restaurant these days. Give me heart and soul in my food any day over fancy restaurant interior design. 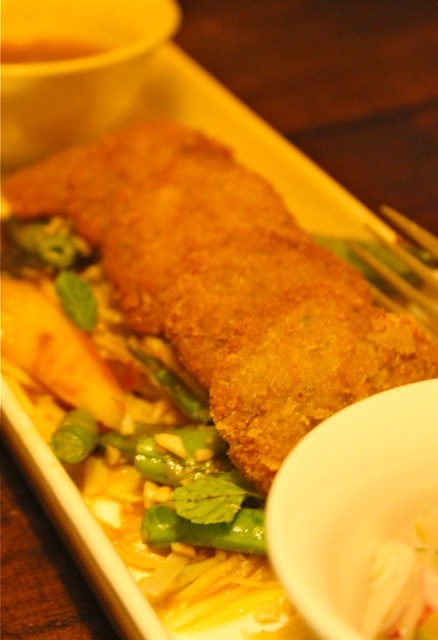 We had this fish dish over noodles twice, once at lunch and once at a dinner. It was delicious as well. Don’t forget to add the sauce that comes with it or you’ll wonder why the dish seems undressed — it is. A platter of grilled pork and veggies seemed like a good idea, but it fell flat on the flavor scale. I guess we should have just steered clear of pork or maybe this was a one off situation. I will say, however, that we visited and dined once where Carmel wasn’t in the kitchen, and the difference was noticeable. In fact, I had just finished telling my dining companions that the food was different when we saw the chef arrive from a well-deserved mini-vacation… so try and make sure Carmel is in town when you dine there. Having said that, I think the cooks have learned how to season more appropriately after some 6 months in training… But it’s interesting how you can tell if someone is missing from the kitchen by tasting the food alone. 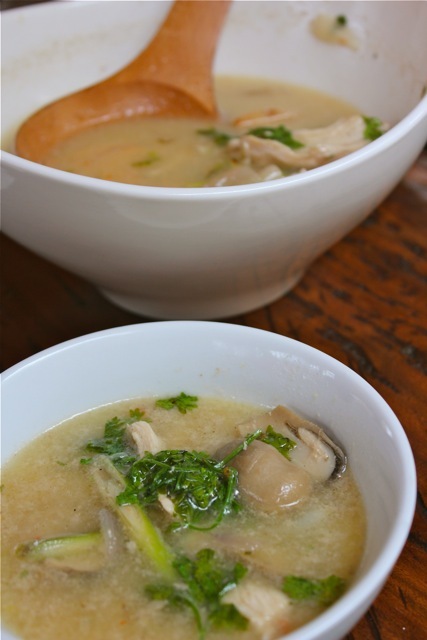 Tom khai gai, a chicken and coconut soup that was SUPERB! I would have licked the bowl if it weren’t inappropriate. 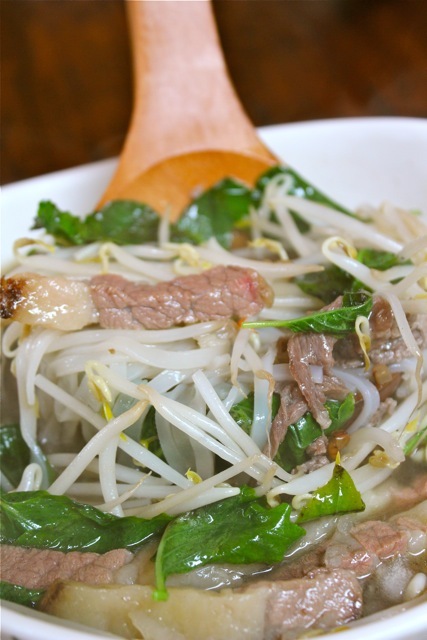 A bowl of pho, the first dish we ever tasted at the restaurant, and oddly, we didn’t quite like it. 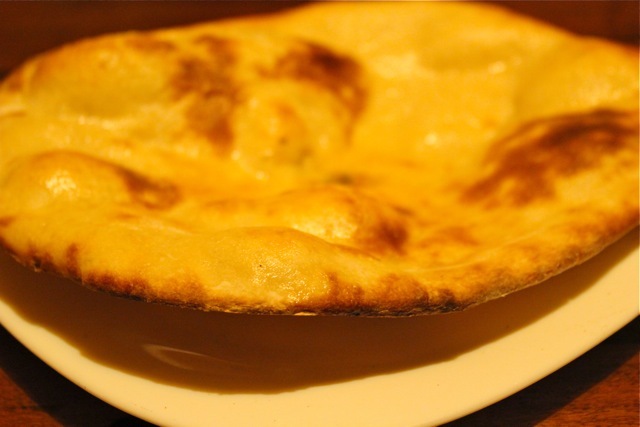 The bowl had unusually tough pieces of beef, with large yellowed fatty pieces as well. Perhaps some smoked pork found its way into the broth? The broth which lacked verve, flavor and depth — perhaps it hadn’t had enough time to concentrate the flavors? But this was a surprisingly weak offering, and I haven’t had it since. I should try it again, because I really do love a good bowl of pho. Finally, Carmel sent out this fancy dessert one day. It was good, but really, overkill after all the great savory dishes. I applaud Mark and Carmel for opening this place in the middle of nowhere (not true, it’s just five minutes from the provincial capitol building), for offering a menu filled with Asian spices and chilies and other good things, for infusing so much soul into their food and for creating an unusual experience for diners. Now, my only hope is, I will still be able to get a table after posting this review! For contact details and location, visit their website, here. 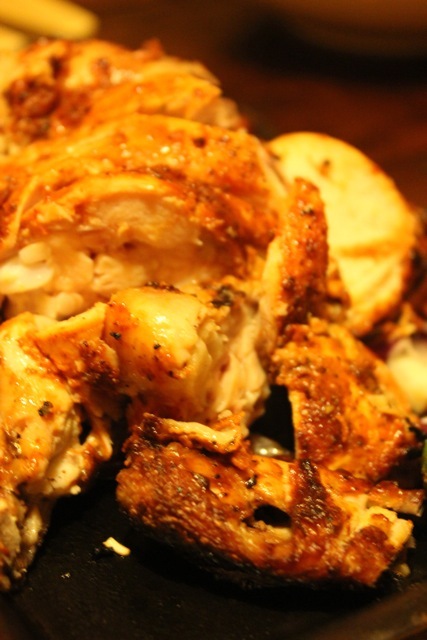 Such a mouth-watering post, MM! How is their bun cha? It’s my favourite Vietnamese dish and regret that I haven’t seen it in menus in Manila. 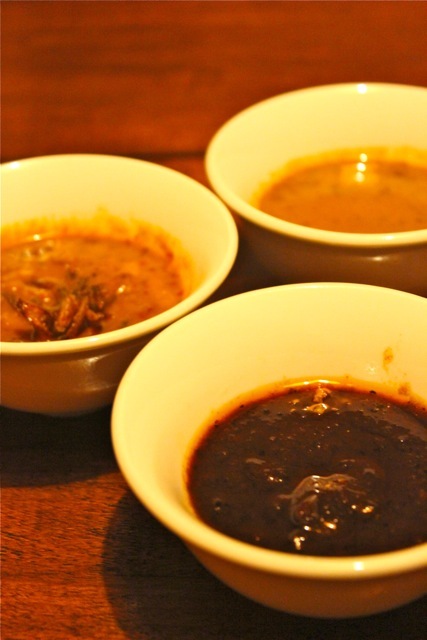 Sorry but where can I buy Sambal in Alabang or Makati? Wow MM, looks like Cebu is fast becoming the culinary capital of the Visayas (if it isn’t yet) thanks to people like you and Carmel/Mark… Another visit to Cebu will be planned…. Oh my gosh, they have almost everything that I love with Vietnamese and Thai food. 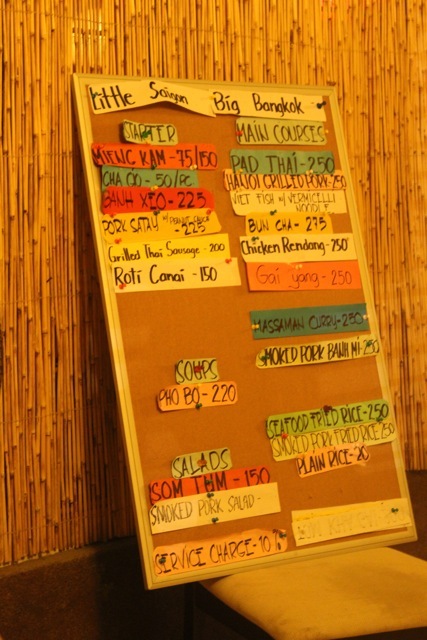 Vietnamese dishes is far cheaper here than Thai and so most of the time, yon ang kinakain ko, kasi nga mas affordable. Cebu is indeed one of the listed cities to visit in the Philippines according to a travel “tsismis” here in our area. I am thinking that on my next trip to Pinas, straight Cebu muna ako before going to my final destination in Quezon Province. Yon nga lang, mag-isa lang pala ako kung ganoon ang gagawin ko. Ummmm… sacrifice just for Zubuchon. Thank you for responding to my sambal question. Asian food is exceptional talaga. 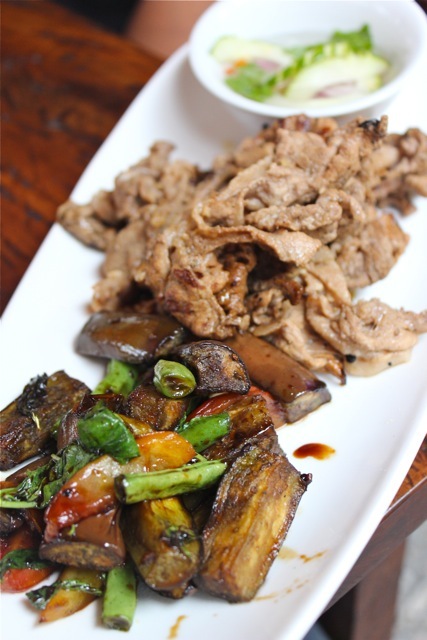 Chinese, Filipino, Vietnamese, Indian and Thai cuisine are always infused with nice herbs. These herbs make the food distinctive from other international cuisine. 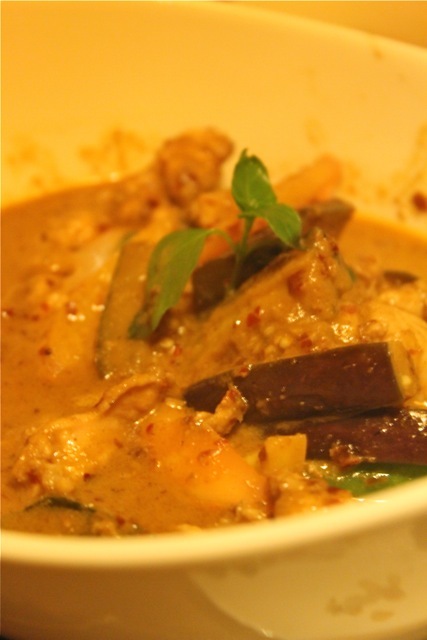 In particular is Thai food cooked with galangal, coriander, chili paste, curris and more. Pagdikit pa lang ng Thai food sa taste bud mo sure enough may ngiti at kiliti agad sa panglasa mo. The nice thing is nagkakaroon ng magandang evolution ang Filipino cuisine at talagang nag i-improve. I think this is because the Filipinos unlike before, only few can travel, but now we are all over the world and experiencing culinary delights and adapting it tour local market. My God, the last “Eyeball” that I attended was in November of 2006. When is the next one? I’ve been stuck in US for a while. Well, I will be home in few days time to celebrate my Mom’s birthday in Sta. Rosa, Laguna. 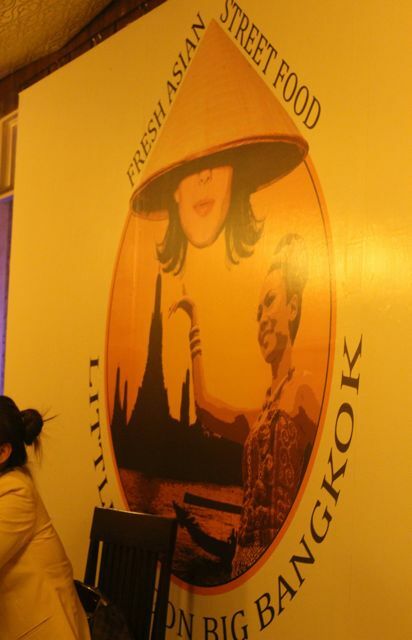 MM, thanks for this post about Little Saigon, Big Bangkok. 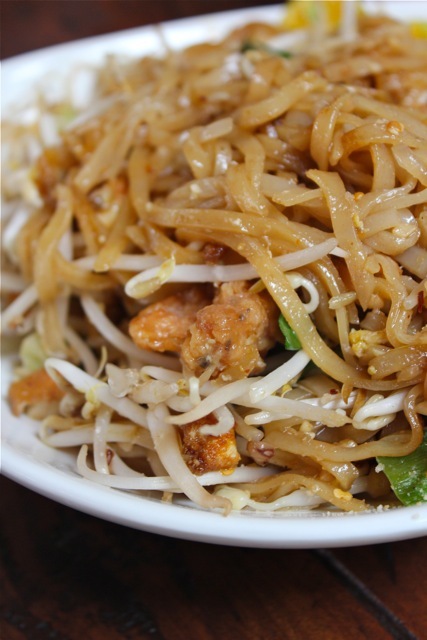 I checked their website as well and they have most of my favorite Thai and Vietnamese dishes. I really need to check it out soon or with our small circle of foodie friends — Joey, Chris B, Lynell, Edik, Joan, Millet, Marla, and Roy — should have a food trip to Cebu soon. I live in Cebu and don’t know about this place! I’m too annoyed with myself! This resto sounds great — will definitely look for it. Danney, buncha is my fav also; so so that I asked a vietnamese friend to teach me how to make it.. and lo and behold..alam ko ng magluto nito.. but mabusisi para sa akin, kay kung hindi man espesyal ang occassion, we just go to our favorite vietnamese resto and order from them. i love that mhiang kham !!! i am drooling !!! i have to visit cebu soon!!!!!!!!!!!!!!!!!!!!! 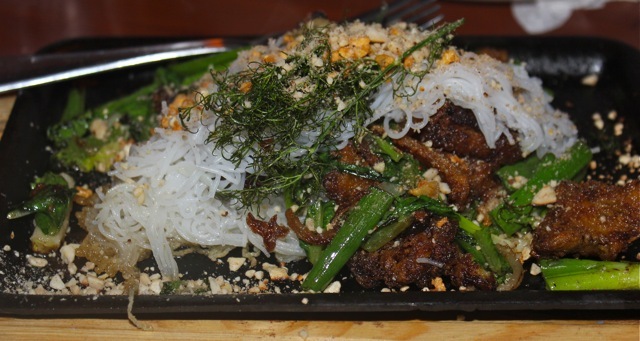 Banh Xeo is one dish I usually order ..very impressive menu…my hubby & I drive to Portland’s Pok Pok ,a northern Thai cuisine restaurant ,pretty good tasting food,now the owner branch out in NY.Wow for Cebu!! would definitely will visit LS,BB after Zubuchon,Cebu is becoming a Culinary Mecca!! 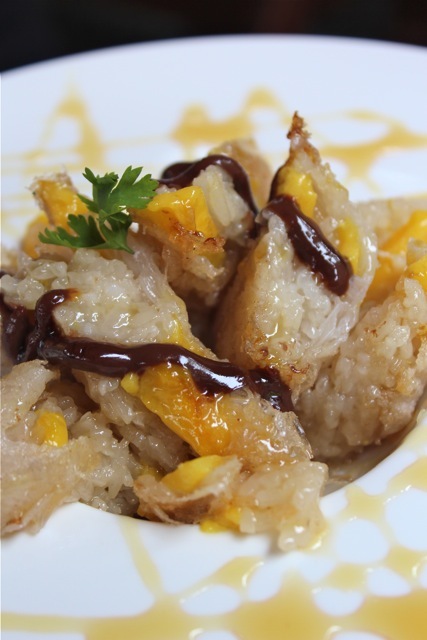 oh wow…something new to try on our next trip to cebu. 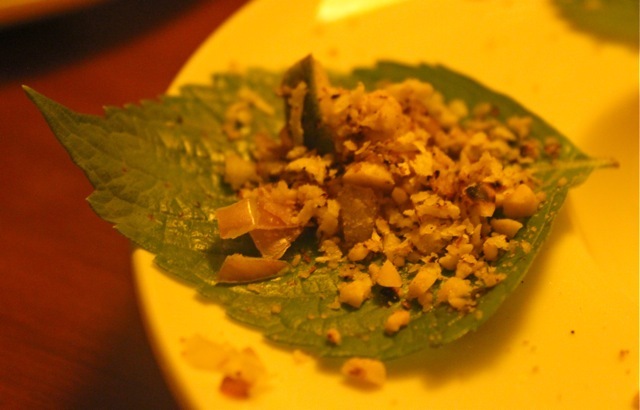 we fell in love with mieng kham on a trip to bangkok many years ago. a lady was selling them from a big bilao, row upon row of leaves rolled up in tiny cones, with all the goodies inside. we’ve been on the lookout for this delicacy since then, and haven’t found anything that comes close to that first experience. this may just be it! thanks for the tip, MM! Their food must be wonderful! I rarely hear MM gush this much about any restaurant. Can’t wait to try it when I’m in Cebu. Great photos. The bread looks more like naan than roti canai and at P150? At that price, I hope it’s more than one piece and comes with a decent curry…etc. But most of all, they know that there is nothing better, nothing more gratifying, than serving people who share your passion for good and interesting food. the dishes aren’t cheap…what one could probably get for 40 pesos for som tum and phad thai in the streets of bangkok are priced for 150 pesos and 250 respectively…the tom khai gai doesn’t exactly look what i’m used to having here also. anyway, come next visit to Cebu maybe will bring some family or friends who have not visited us here yet for them to have a “taste” of Thai food. Wow! the food looks great! I need to get to Cebu soon! to try this place!